All classes are held at Make It Sweet in Austin and opened to all experience levels unless noted. Register early, classes can fill quickly. Register thru our Online Store or Contact us. Payment is required at the time of registration. The class fee is refundable only up to 1 week before class date. If at anytime you are unable to attend class, please notify us in advance. Children 12 and older are welcome to attend any class unless noted. Those under 12 and at least 8 must be accompanied by a paying adult. Children under 8 may only attend classes designated for their age. Children must be able to pay attention and follow along with the project. If parents attend they must pay for a place in class. This summer we are offering 10 different classes for kid's ages 6 - 12 years old (older kids are encouraged to take the normal adult classes). These are all drop-off classes. These classes are not eligible for any sale. Register for 5 or more spaces in these classes and receive a $5 discount on each class. Register in advance to secure a slot. Kids will have a Magical time in this class! Each child will learn how to ice a single tier cake. Then put their own twist on making a unique unicorns. We will have fun buttercream colors to choose from, and cool sprinkles to add a big pop! Each child will leave with their own magical unicorn cake. Cost: $50 No supplies needed. In this class we will bake two different types of cakes from scratch. Then use fun shaped cutters to layer and stack. We will use fruit and other fun toppings to decorate our mini shortcakes. Each child will leave with a box of their own made mini shortcakes. Kids will have fun making these beach theme cupcakes. We will use multiple colors of buttercream , cookies and candy to decorate them. Each child will leave with a dozen cupcakes they decorated themselves. Kids will have so much fun in this hands on class! Decorating fun cool shaped cookies like cowboy hats and pinatas! Each child will learn how to outline and flood each cookie. Everyone will leave with their own box of cookies they decorated. Learn the basics in fondant in this fun cow cake class. Learn how to cover a cake with fondant, and work with fondant tools to make the cow's face, horns & ears. Each student will leave with the cake they decorate in class. Learn how to cut cookie dough, assemble and decorate cookies to make a beach themed cookie scene. Students will learn how to cut dough using cutters & templates, and decorate their scenes with royal icing, and edible images. Each student will leave with the scene that they complete in class. The method that we use to make pizza dough is so easy - and makes delicious pizza. Everyone will be making their own dough and we will make a sweet and a savory style pizza to take home. Learn to make delicious soft-style pretzels and use the dough to make other sweet and savory treats. Everyone will make their own dough in class. Students will be taking home traditional soft pretzels, cheezie pretzel bites and cinnamon and sugar monkey pretzel muffins. Everyone will learn to make empanada dough from scratch. They will then use the dough to make a variety of sweet and savory empanadas. Students will go home with empanadas they make in class. Candy, candy and more candy! In this class we will be making bark type candies, dipped cookies and pretzels, white chocolate popcorn and more. Everyone will bring home a bag of sweet treats. These special classes are designed to allow class participants to bring their favorite adult beverage and enjoy many of the classes we offer. So gather your friends and enjoy these more relaxing classes. While designed to be adult only, younger participants are allowed, but only with accompanied adults. Openers, cups and snacks will be provided. Please drink responsibly. Try the latest cookie craze in this new hands on baking/decorating class. Learn how to use templates to hand cut a new cookie recipe. Decorate your tart with cream cheese filling, and adorn it with fresh fruit, confections, candies, sprinkles, and/or flowers. Each student will leave with the tart that they create in class. Cost: $69 No supplies needed. Learn the basics in Fondant in this fun animal face cake class designed for kids and adults alike. Create a new animal face every season. Learn how to cover a cake with fondant, and work with fondant tools to create facial features. Each student will leave with the cake that they create in class. S’Mores are oh so delicious – and even better when they are homemade! We will make and bake graham crackers, make marshmallows from scratch and assemble them for dipping into chocolate. These are delicious treats that we will have fun making. All students will leave with some s’mores to take home. In this class participants will learn how to color cake batters and bake it to make different effects for the insides cupcakes including rainbow graduated colors, tie-dye, polka dots and other shapes. These fun techniques make the inside of the cupcake a colorful surprise when it is cut and served Everyone will be able to take the cupcakes home with them. Cost: $60 No supplies needed. In this class you will lean to make a simple cake adorned with wafer paper ranunculus and leaves. Learn how to cut, condition, and dust wafer paper with petal dusts to create different sized ranunculus & leaves. Each student will leave with the cake that they make in class. Love those beautiful geode cookies you’ve seen online? This class you will be able to create 6 unique geode style cookies. For this class you will learn how to create and decorate with rock sugar as well as some basic painting techniques. In this class students will make several different styles of classic Mexican Pan Dulce including the popular concha. Students will leave with a variety of the sweet breads that they make in class. Not sure where to start with fondant? Then this class is for you! This beginner level class will teach you everything you need to know to start working with fondant. Learn how to work with fondant tools. how to make a bow with tails, simple inlay & onlay decorations, as well as how to cover a cake with fondant. Each student will leave with the cake they decorate in class. Class is suitable for ages 13 and up. In this class you will create one of the popular 3-tiered unicorn face cakes you've been seeing everywhere! Learn to make and work with Swiss buttercream! Find out the tricks and secrets to get a perfect Swiss buttercream that tastes amazing and looks silky smooth everytime! Overcome challenges with Swiss or discover a new favorite icing style! Accent your cake with fondant details and a cake topper! Participants will cover a cake in fondant using texture techniques and impression mats to achieve a fun & modern design. Each student will leave with a cake they complete in class. This class is not eligible for discounts or sales. Enjoy a special day with your child on this Saturday before Mother's Day. Work together to decorate a beautiful set of cookies that can be enjoyed the next day. For children 6 and up. Morning and afternoon class will decorate the same themed cookies. Cost: $50 for Mom and 1 child, additional child is $15.00. No supplies needed. This class is not eligible for discounts or sales. Enjoy a special day with your child on this Saturday before Father's Day. Work together to decorate a beautiful cake that can be enjoyed the next day. For children 6 and up. Morning and afternoon class will decorate the same themed cake. Cost: $50 for Adult and 1 child, additional child is $15.00. No supplies needed. In this class we will take classic Swiss Roll cakes to the next level with colors and designs to make a decorative, fun and delicious cake! We will work in groups to make the batter and then everyone will be making their own cake designs. Everyone will leave with their completes cake. This class will cover basic techniques such as carving, icing, covering the cake with fondant and stacking. Students will learn the skills necessary to replicate the very popular geode design cake, including working with luster dusts, rock candy & painting with gel colors. Each student will take home their 2-tiered geode designed cake. A light lunch or snacks will be provided. Cost: $125 No supplies needed. Students will make their own base dough in this class and then we will make and bake 3 flavors of bagels – Asiago Cheese, Cinnamon Raisin and Everything. While the bagels are in the oven we will make a sweet and savory cream cheese spread to take home and enjoy with the bagels. Everyone will leave with 9 bagels. In this baking class, students will each make the basic English Muffin dough for the classic flavor. We will also add to that to make Blueberry and Cheddar Cheese flavors. While the English Muffins are rising, we will make butter from scratch. It is a delicious indulgence to go with these English Muffins. Everyone will leave with 9 large English Muffins. Learn how to transfer any image onto a cake with a buttercream transfer in this beginner level class. Students in this class will also learn how to level, fill & ice their cakes, and finish off their cakes with a decorative border. In this full day class students will be making 3 distinct cake recipes. We will start with each group making a Butter Cake, a Sponge Cake and a Chiffon Cake. While the cakes are baking and cooling we will make three kinds of icing – a Swiss Meringue Buttercream, an American Buttercream and a Cream Cheese Icing. We will discuss variations to these recipes to change-up flavors. Everyone will leave with a sampler of cakes and icings. In this class students will learn to make empanada dough from scratch. They will then use the dough to make a variety of sweet and savory empanadas. Students will go home with empanadas they make in class. Learn how to use and apply stencils on cakes as well as for fun decorations. Each student will fill, ice, and cover cake with fondant and then use stencils to create some fun designs and decorations. In this class we will make 3 crusts and make 3 different tarts – 2 sweet and 1 savory. The crusts include a crumb crust, a sour cream butter crust and a shortening crust. The tart flavors will change seasonally. Everyone will take home a box of assorted tarts. Join Chef Pavla to learn how to make traditional Linzer, Coconut and Kolache Cookies. Students will be making the doughs, forming and cutting, baking and assembling the cookies in class. Everyone will leave with an assortment of cookies. These recipes and techniques that you will learn will be helpful when you are making cookies at home. In these classes students will be creating a meal to take home that will be enough for up to 4 people. In the class, we will make the dough or pastry, prep the items for the main dish and make the extras that complete the meal. Students will box and bag up their items and take it home to bake and serve. The menu changes monthly. Please note that each student will be customizing their own items, so preferences can be accommodated, but major food restrictions such as gluten free, vegan or vegetarian options will not be available. Please contact us if you have questions about the menu. Create a buttercream flower garden on your smoothly-iced cake. During this class you will learn how to smoothly ice a cake and decorate it with a wreath of seasonal buttercream flowers. You will leave with a beautiful cake that you complete during this hands on class. Create a buttercream flower basket! During this class you will learn the techniques of basketweave and seasonal buttercream flowers. You will leave with a beautiful cake that you complete during this hands on class. Learn to make the soft and tender dough for fruit and cheese kolaches and rolled sausage klobasniky. Students will work in teams to make the dough and while it is proofing, a pre-made dough will be used to start making the kolaches. Everyone will leave with a variety of sweet and savory treats to take home. We are excited to have Chef Pavla teaching these Czech classics. Learn to make the dough, how to roll it thinly, and filling, rolling and baking 2 kinds of strudel. Everyone will leave with their baked strudel and dough to make more! Chef Pavla will be teaching this class. Ask her in class how many strudels she has made! Learn how to assemble and decorate a holiday/season themed cookie scene. Students will learn how to cut cookie dough using cutters & templates, decorate their scenes with royal icing, and edible images. Each student will leave with the scene that they complete in class. Learn how to assemble and decorate a holiday themed 3D cookie box. Students will learn how to cut cookie dough from a template, and decorate their boxes with royal ] icing, and edible image paper. Each student will leave with the box they complete. In the hands-on class students will learn how to prepare gelatin to then make decorations like bubbles, butterflies and bows. These decorations will go on top of cupcakes for students to take home, but they can be used on cakes, cookies and more. Learn how to make delicate gelatin flowers and bows. This hands on class will show you how to make and decorate with gelatin. We will create wired gelatin flowers and loop bows using texture sheets. This is the next level in cake balls and students should have taken our cake ball class. Students in this class will be forming and decorating cake pops on sticks. This is a seasonal class, so the designs will be themed to the current season. Students will leave with the cake pops that they make in class. Learn to ice a cake using buttercream to achieve a watercolor finish, adorn it with buttercream, candy, and chocolate clusters with a drip accent. Each student will leave with a cake they complete in class. This class will delve into the topic of how to modify the amount and types of flours, fats and sugars that are used in baking in order to produce healthier yet still tasty results. Students will be making a cake and a cookie recipe in class and will be taking home their finished treats. We will also be discussing how to adjust recipes with substituted ingredients and techniques to produce a more guilt-free finished product. You have probably seen these beautiful cakes on Instagram or Pinterest. They are stunning, mesmerizing and tasty. In class, we will demonstrate icing with a butter based buttercream and chocolate ganache buttercream. Everyone will ice 3 cakes that will be poured with the colorful white chocolate mirror glaze. Create a beautiful, seasonal themed cookie bouquet in this intermediate class. Learn to make and decorate cookie pops using various decorating tools and techniques. Each student will arrange their own cookie bouquet of 6-8 cookies to take home. Make seasonal buttercream flowers on cupcakes and arrange them into a bouquet on a cake board. Students will learn to use a flower nail to create individual and clustered flowers that are beyond basic flowers. Learn to decorate a cake with with fondant. In this class students will learn color marbling and texture techniques, how to cover a cake with fondant, and how to cut and form fondant flowers. Each student will leave with a completed cake to take home. Learn how to decorate henna mehndi style piped cookies in this intermediate class. Students will learn how to transfer images, and pipe 5 different styles of cookies. Each student will leave with 6 cookies. Have fun with edible painting on cookies! In this class, you will learn painting skills as well as utilize wafer paper, edible markers and piping to create a beautiful themed cookie set. This class is for adults only because of the attention to detail required. Learn basic techniques to work with gumpaste while making and assembling a delicate full flower peony, peony buds and leaves. Coloring gumpaste and using dusts to shade will be covered in this class. This class is for all levels and does not require prior experience. Students will all work on their own flowers that they will take home to save and display. Learn basic techniques to work with gumpaste while making and assembling a truly Texas bluebonnet. This class is for all levels and does not require prior experience. Coloring gumpaste, using dusts and painting details will be covered in this class. Students will all work on their own flowers that they will take home to save and display. Learn basic techniques to work with gumpaste while making and assembling a Hibiscus. This class is for all levels and does not require prior experience. Coloring gumpaste, using dusts and painting details will be covered in this class. Students will all work on their own flowers that they will take home to save and display. Learn basic techniques to work with gumpaste while making and assembling a Poppy. This class is for all levels and does not require prior experience. Coloring gumpaste, using dusts and painting details will be covered in this class. Students will all work on their own flowers that they will take home to save and display. Cakes made with the Russian piping tips are all over Pinterest and the Internet. These tips create a beautiful, intricate flower with just one squeeze. Everyone will practice with the tips before applying the techniques to their cake that they will take home with them. Learn to make delicious homemade marshmallows. We'll use one basic recipe and transform it to make several flavor combinations. For example - Caramel, Mint Chocolate Chip, Strawberry, Vanilla Bean, etc. Each student will leave with a box of marshmallows. Learn to make modeling chocolate and use it to wrap a cake in a beautiful design, finish with roses and yummy decorations. Students will leave with their cake. Create a beautifully edible chocolate box that would be perfect as a gift or any sweet event! You will learn to model chocolate into a box and embellish it with a delicate brushed embroidery technique. Recipes will be provided for delicious truffles to fill the box. You will leave with the box you create in this hands on class. No supplies needed. During this hands on class you will make a variety of muffins and loaf breads. Recipes and tasting will be provided. Each student will leave with a variety of muffins and loaf breads you create during class. No supplies needed. Learn how to make a quick puff pastry that is flaky and buttery and can be used for so many savory and sweet treats. Everyone will make their own batch of pastry and then we will make pigs in a blanket, parmesan cheese straws, palmier cookies and fruit turnovers. Students will leave with a project they create during class. These pretzels are the soft chewy kind that are sold warm on almost every street corner in New York City. Everyone will make their own dough. We will prepare toppings to make different varieties â€“ traditional salt, cinnamon sugar and parmesan herb cheese. We will roll, shape, top and bake them. Everyone will leave with a box of pretzels that can be eaten right away or saved and rewarmed. During this hands-on class students will learn to make a variety of hard candy using different methods and molds. Each student will take home a variety of candies they make in class. Since this class involves hot sugar participants must be 12 or older. During this hands-on class students will learn the properties of baking Angel Food Cake along with baking two different kinds. You will also learn different sauces to enhance your cakes. Each student will leave with the Angel Food Cake and sauces they make during class. Have you ever wondered how to get those perfectly sharp edges on a cake? Well here you go! During this hands-on class you will learn how to use the Acrylic Disk Technique using Ganache Icing to create a super smooth and sharp edged cake. Students will take home the cake they create in class. There are many types of pizza. In this class everyone will make two different doughs; one to make a traditional Chicago style deep dish pizza and the other to make a flat bread pizza and even a dessert pizza. Everyone leaves with their pizzas to bring home and enjoy. During this class students will learn how to smooth ice a cake and adorn it with different piping techniques to create lace patterns and designs. Each student will leave with the project they create during class. The rose is the most classic of any of the gumpaste flowers. 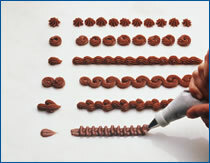 During this class you will create a variety of sizes of gumpaste roses. Each student will leave with the roses you compete during this hands on class. You have seen these cakes all over the Internet - cakes where it looks like syrup is pouring onto a waffle, candy falling onto a big mound of candy or a fork lifting spaghetti and meatballs out of the cake. In this class we will explore many ways to make these cakes happen and make them stable. Everyone will make a smaller version in class. We will be working with structure, fondant and more. Students will learn to make several kinds of baked donuts with a variety of toppings. Everyone will take home a box of 12 assorted mini donuts they make in class. In this class you will ice and decorate 3 mini cakes using modern techniques. You will learn to smooth ice your cakes then add texture to each of the 3 mini cakes. You will leave with cakes you complete during this hands on class. Whether it is for a Wedding, Baby Shower, Birthday Party or any fun occasion this delicate ruffles and petal design will be a perfect addition. During this class you will learn to smooth ice a cake then work with colors along with buttercream piping techniques to complete your cake. You will leave with a beautiful cake that you complete during this hands on class. Classic designs never go out of style. During this class you will learn how to smooth ice a cake and add a delicate cascading floral design that would be perfect for any occasion. You will leave with a classic cake that you complete during this hands on class. In this class you will explore different buttercream designs as well as practicing different border techniques. You will leave with a cake you create in this hands on class. During this class you will create a buttercream cake adorned with seasonal themed decorations. You will leave with a cake you complete during this hands on class. Succulents are a staple in Texas. During this class you will learn to model different types of succulents that will perfect to add to any sweet creation. You will leave with six cupcakes with succulents you complete during this hands on class. Learn to bake cupcakes with a little "kick". During this hands on class students will learn how to make cocktail inspired cupcakes. Recipes and tastings will be provided. Students will leave with cocktail cupcakes they create during class. During this hands on class you will create a variety of scones and biscuits to enhance any occasion. Recipes and tasting will be provides. Each student will leave with a variety of scones and biscuits you create in class. Whoopie Pies are two soft cookies with a creamy filling sandwiched in between. During this class you will make several varieties of Whoopie Pies that you create during this hands on class. Recipes and tastings will be provided. Each student will leave with several Whoopie Pies they create during class. In this class you will learn how to color cake batters and bake to make different effects for the insides of cakes and cupcakes including rainbow graduated colors, tie-dye, polka dots and other shapes. These fun techniques make the inside of the cake a colorful surprise when it is cut and served. Learn to bake a variety of different cookies. Recipes will be provided and each student will leave with a box of goodies. During this class you will learn to mix, roll and finish Cinnamon Rolls and Braided Coffee Cake Bread. In this class we will discuss the properties of yeast and making successful breads at home. This class is a combination demonstration and hands on participation. Tastings and Recipes will be provided. Each student will leave with Cinnamon Rolls and Braided Coffee Cake Bread. Cost: $69. No supplies needed. During this class we will discuss the properties of yeast and making successful breads at home. You will learn to mix, roll and finish Dinner Rolls and Herbed Focaccia Bread. This class is a combination demonstration and hands on participation. Tastings and Recipes will be provided. Each student will leave with Dinner Rolls and Focaccia Bread. Combine this class with the Breakfast Yeast Breads class for the full bread baking experience. Learn about different airbrushes and compressors. Then learn and practice techniques in this hands on class while you use different media. In this hands on class you will first create a 2D cake by sculpting and covering with fondant. You will then continued to build on your airbrush knowledge and skills by bringing the cake to life. Basic airbrush class or similar skills preferred. No supplies needed. Learn the basics of making delicate French macarons! In class students will make several flavors and fillings. The class will be a combination of demonstration and hand-on practice of the technique. You will leave with an assortment of macarons you assemble in class. Learn the basics of covering a cake with fondant in this hands on class. Each student will leave with their own creation. Cakes are usually themed to the season and involve covering a cake with fondant and some simple fondant decorations. No experience needed. Learn to decorate cupcakes beyond the basics. Create some adorable cupcake characters, shapes, animals, bugs, etc. Each group of seasonal classes will have different designs but will include 9 to 12 cupcakes that the student can take home. Learn techniques for decorating beautiful seasonal themed cookies. Cookie baking, royal icing, flooding, fondant, piping and use of sprinkles and a number of other techniques are typically covered. Recipes will be provided. Each student will leave with their own decorated cookies from this hands on class. Each group of seasonal classes cookies are different. Learn to use the delicate technique of brush embroidery and use detailed stencils on cookies during this hands on class. Students will leave with several cookies using each of the different styles during class. This class is not for beginners. Some experience or a basic class in cookie decorating is required. Flooding is a technique using different thicknesses of royal icing. During this hands on class you will explore and practice ways to use flooding to take your cookie designs to the next level. Students will leave with several cookies they complete during this class. This class is not for beginners. Some experience or a basic class in cookie decorating is required. Learn to make your own cake balls. A combination of cake and icing rolled in a ball and covered with chocolate. The variations are endless. Students leave with the cake balls they create. Learn to make decadent chocolate truffles! In class we will make several flavors of ganache fillings and learn to temper chocolate. Students will make truffles in candy molds, hand enrobed truffles and cocoa coated truffles. Everyone will leave with an assortment of the candy made in this hands-on class! No supplies needed. Cost $69 No supplies needed. During this hands on class, students will learn to bake, fill, and decorate a variety of petit cakes. You will take home a variety of petit fours you create in class. Recipes will be provided. This class is a combination demonstration and hands-on practice class. Pies for the fall season will be pumpkin and pecan. Learn to make pie crust. Recipes will be provided. Each student will leave with sample mini pies created in class. You like the look of fondant but not the taste? Then this is the class for you. Rolled buttercream looks like fondant, tastes better, and is easier to do. Come and learn how easy and fun this is. You will cover a cake, and do crimping, modeling, embossing, brush embroidery and borders. Come learn this interesting technique. Recipe will be provided. Learn how to construct tiered cakes for any occasion using dowel rods, stacked, 2-plate and pillar construction methods. Students will then build their own 2-tiered cake in class to take home. Make It Sweet is a great place for group parties and events! Projects can include cupcakes, cookies, cake balls, truffles, macarons and more. Each person usually decorates their own project and takes it home as their party favor. Cost ranges from $25 - $40 per person depending on the project and length of the party. Scheduling may be difficult if not arrange 2 months in advance due to our existing class schedule. More detail information is available by clicking on the "Private Party Details" below or by emailing us at classes@makeitsweet.com. Sallia is a long time Wilton instructor and has been inducted into their instructor's Hall of Fame. She also is owner of Just Desserts which creates some wonderful wedding and special occasion cakes. Jennifer is an owner of Make It Sweet and has used her training and knowledge to teach a number of classes over the years. She's a graduate of the Culinary Academy of Austin and loves to teach. A number of years ago she was an assistant for a contestant on the Food Network Challenge. Hailey owns Cecelia's Cakes ATX where she creates fun and interesting custom cakes. She loves to share her knowledge of cake and help people work through any project. Magda joined Make It Sweet while working on her extership from the Culinary Academy of Austin. She has been Jennifer assistant for six years and is now teaching classes on her own. She has decorated cakes professionally for years. Kelly is the owner of Kelly's Cakes in Austin. She has been designing one-of-a-kind cakes and cookies professionally for 10 years. She is an award winning decorator, and loves to teach! Pavla has worked as the pastry chef at a couple of country clubs before becoming an pastry instructor at Auguste Escoffier School of Culinary Arts. She cares deeply about every student and is very proud of her Czech heritage.